standards required for registration is posted below. exhibiting faults in one area or another may still be able to be registered. disqualified and not eligible for registration. is alerted. 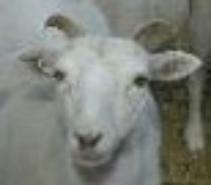 Ewes should have a more feminine face and features than the rams. Ewes similarly may present a straight profile when viewed from the side profile. dominant color of the New Mexico Dahl Breed. sheep actually have two coats: a hair type coat and usually a more wooly undercoat. weather arrives with the exceptions of lambs and some yearlings. the climate. Lambs and some yearlings may not shed totally till the next year. that are not desirable or of having wool parent breeds in the recent background. more) and will be registered under the "Typical" category for coat coloration. need not disqualify the animal. 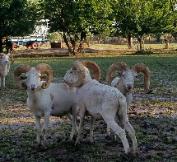 registered in the category of "Oñate" New Mexico Dahl sheep. can be bi-colored (two colors), tri-colored (three colors), and quad-colored (4 colors). those who record ABOVE average are more desirable for breeding purposes. The weight of the sheep varies and individual sheep may weigh outside the range. 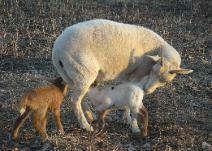 Ewes may weigh 80 - 180 lbs with an average of 90 - 130 lbs. though, may attain weights of 300 lbs or more in their 4th or 5th years. parallel or higher when on alert. 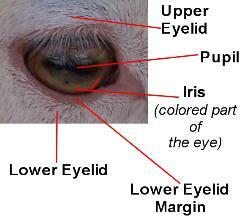 indicate cross-breeding in the background of the sheep. TO THE RIGHT AND PHOTO TO THE LEFT. Natural ears may vary in length but are generally in the range of 3 - 4 inches. such: E indicating Elf Ears, G indicating Gopher Ears, and N indicating Natural Ears. The colors of the eyes vary from deep dark brown, golden brown. incisor teeth and the dental pad is a disqualification. gracefully held when sheep are alert. 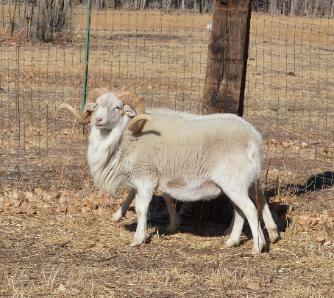 A ewe’s neck will be graceful and proportional in size based on the ewe‘s overall frame. growth around the neck area which will make the neck look much larger. completely in the summer while others will retain the mane. is a fault and is discriminated against (though not a disqualification). sheep. They should flow into the ribs (well laid into the ribs). have a completely straight top-line with no elevation. athletic look - proportional to the size of the sheep. the sheep to facilitate lambing. proportional for smaller sized ewes. The bottom line should not be tucked in at the fore-flank or the rear-flank. 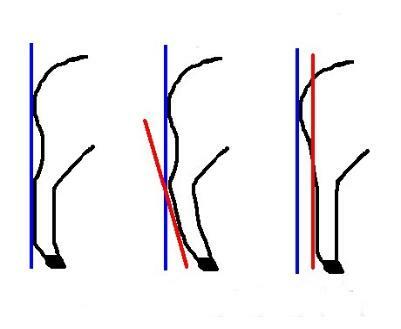 legs, usually longer than body height from bottom line to top line. Rams will generally have thicker legs than ewes. Legs should have a conformational correct appearance without double-jointedness. Pasterns should be strong and correct. stance is desired with legs standing nicely in line with the body of the sheep. dock. Size and muscling of rump are proportional to the size of the overall sheep. and shows the depth of muscling in this area. sheep. SEE MEASURING DEPTH OF TWIST ILLUSTRATION TO THE LEFT. be free of obvious defects affecting function. Both Testicles should be uniform and symmetrical, free of obvious deformities. SEE TAIL LENGTH ILLUSTRATION TO THE RIGHT!!!! 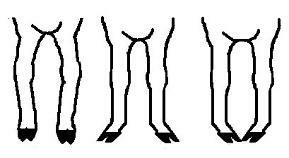 Hooves should be well formed and kept free of deformities and disease. dark colored hooves require less clipping maintenance and are preferable. weather, and for rival competition over mate selection. 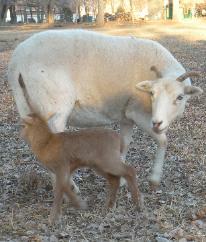 your sheep has more than two horns or if your ewe is polled (without horns). Heart Shaped horns (Supracervical). Some may be wider than others at the "tips." (Homonymous) are preferred over classic horns that may grow close to the face. SEE HORN SHAPE PICTURES TO THE RIGHT. Horns are more round in circumference. This is the most common actual horn shape. straight up. 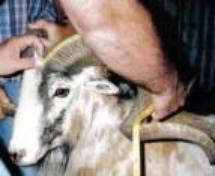 To indicate Horned Ewes in the registry, HE is the abbreviation used. SEE PICTURE TO THE LEFT. (rate at which the horns grow) is also dependent upon some of the above factors. generally grow at a much slower growth rate. guideline for consideration in future breeding endeavors. 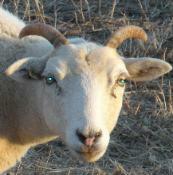 Ewes' horns should be a minimum of 6" in length at maturity (2 to 3 years old). a strongly suggested guideline for consideration in future breeding endeavors. 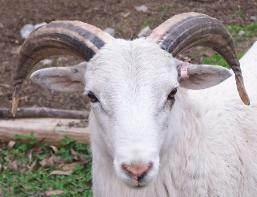 Bases on mature rams generally run eleven to fourteen inches in circumference. much less than the rams. 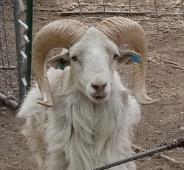 similar, certain breeds prefer certain colors of horns. 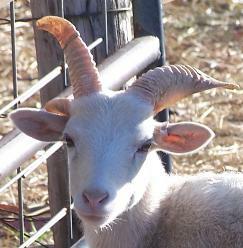 variegated horns may become more washed out in appearance. SEE HORN COLOR PICTURES TO THE RIGHT!! million sheep, with 65% being in the Alburquerque area. credit to the ranchero planners and breeders of anonymity and antiquity. Donald A. • 1/8 or less of wool or other sheep parent breeds. • 25% or less of Bighorn blood is allowed. • Sheep at maturity normally exhibiting shedding ability. 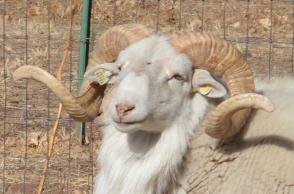 • Rams’ horns which come within three inches of the face at maturity. • Extra Teats on ewes. • Slight under or overbite, with teeth just barely touching the edge of dental pad. • Sheep which do not shed out completely at maturity on a general basis. 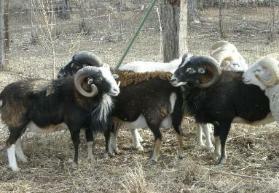 • Mature rams with no mane at any time. • Tails reaching all the way to the hocks. 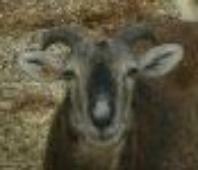  Sheep with more than two horns (such as Jacob Sheep).  Sheep that are polled.  Tails past the hocks. 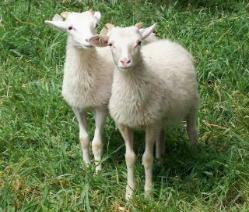  Sheep with more than 1/8th known wool breeding from the parent breeds. 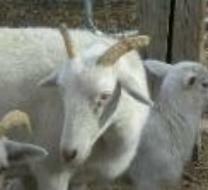  Sheep with any known wool breeding from any non-parent wool breed.  Sheep with known Jacob bloodlines.  One or both testicles not descended. Hampshire, Dorper, Katahdin, St Croix, etc.  Entropion (inverted eyelids) or other genetic eyelid defects.  Naturally occurring droopy or floppy ears on adults.  Elf or Gopher Ears. such traits seriously challenge the breed identity. or above for these sheep. measure and score YOUR ram!